I ran end of year gradings at half of my affiliates this year in Sydney (Minchinbury, Macquarie Park, Kemps Creek), Nowra and Brisbane. Well done to all the students who graded. And a big congratulations to all the instructors of the affiliate schools for being great coaches! The best Christmas Party ever! SPMA Concord celebrated their 2016 Christmas party with 175 students, family and friends at all you can eat Korean BBQ in Croydon. Everyone had a great time enjoying good company and good food and ate until their heart’s (stomach’s!) content. At the end of the lunch the annual awards were presented with the following well deserved winners. Adult Competitor of the Year: Sam Senan. Sam won 5 out of 5 gold medals in white belt divisions this year and was the number 2 ranked white belt in the whole country. Adult Most Improved of the Year: Philip Kim. Phil has shown that even an advanced student can be Most Improved of the year. At the World Championships this year he defeated the reigning No gi World Champion, he won his MMA debut in convincing fashion and is now a coach at SPMA Concord. Kids Competitor of the Year: Guy Vaccaro. Guy started the year with second and thirds and finished the year with gold medals. Kids Most Improved of the Year: Amelia Roufas. Amelia’s technique and attitude towards training is second to none. She also won her last BJJ competition. Congratulations to all the winners! I am proud of you all. After the presentation we had 3 enormous cakes which were demolished in record time. Thank you to Phil Kim who organised the cakes from Christophe's Patisserie. Big thank you to Michael Bray from the Pine Inn who donated 12 bottles of wine to our party. I want to thank all of my staff (John, Sari, Adam, Phil and Nobby) who helped organise it and make the day run smoothly. They have made the entire year run smoothly. Thank you to all the great students of SPMA Concord who are the reason we do what we do. Let’s make 2017 the best ever! And thank you to their family and friends who came and celebrated with us. https://teamperoshmma.com.au/wp-content/uploads/2016/12/SPMA_Concord_Christmas_Party_Staff.jpeg 1536 2048 Anthony https://teamperoshmma.com.au/wp-content/uploads/2017/07/logo.jpg Anthony2016-12-23 08:25:152016-12-23 08:25:15Christmas Party! 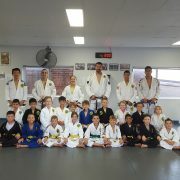 Congratulations to everyone who graded in the Kids BJJ classes at SPMA Concord in Sydney. Special mention goes to Xavier Ricci-Carver who earned his Green Belt after 6 years of training. 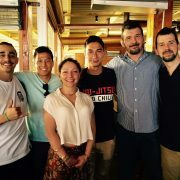 Not only did he do his techniques perfectly but he also participated in the first ever Kids BJJ shark tank! And he is only 11 years old! Well done Xavier we are all very proud of you. Everyone demonstrated great technique. A very big thank you goes to my great staff and great coaches Sari Redzeposki, Adam Assuncao, Philip Kim and Nobby Kuandyk for helping everyone achieve their goals. See you on the mat (but I will see you at our Christmas Party first!). Another great night in Sydney of reaching milestones and celebrating at the SPMA Concord Thai Kickboxing grading on Thursday 8th December. A new Black T-Shirt was awarded, 2 new Purple T-Shirts, a Blue T-Shirt and a number of Red, Orange and Yellow T-shirts were awarded. Congratulations to new Purple T-shirts Dean Young and Cameron Lockey. After a warm up, demonstrating great technique and padwork they got through 10 rounds of sparring including shark tank! Congratulations to Nathan Maitre who graded to Blue T-shirt after demonstrating great technique, padwork and 8 rounds of sparring. Congratulations to the other 40 students who graded to Yellow, Orange and Red T-Shirt. The night ended with Sari Redzeposki being awarded her Black T-Shirt in Thai Kickboxing. After 14 years of training, competing and coaching she is now the first female at SPMA to receive her Black T-Shirt. 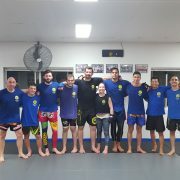 What a night in Sydney on 7th December at the BJJ (Brazilian Jiu jItsu) grading at SPMA Concord. A night to remember! The end of year grading is an event to celebrate many milestones with your fellow students, team mates and friends. There were a lot of highlights! 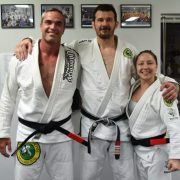 I awarded Tony Pycroft and Sari Redzeposki their BJJ Black Belt. Both are very well deserving and inspirational students. They followed different paths to achieve Black Belt. Tony started BJJ in 2009, has won many competitions at all belt levels including Australian and Pan Pacific titles and is a great coach. And what many people don’t know is that he lives 100km from SPMA Concord! 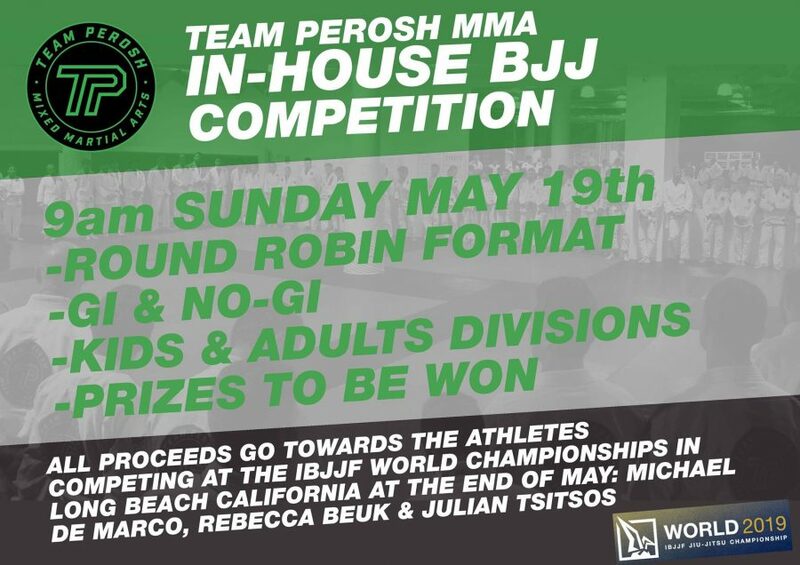 Sari started BJJ in 2002, has also won many competitions at all belt levels including Australian and Pan Pacific titles and is a great coach. Sari is the first female from SPMA to receive her BJJ Black Belt. 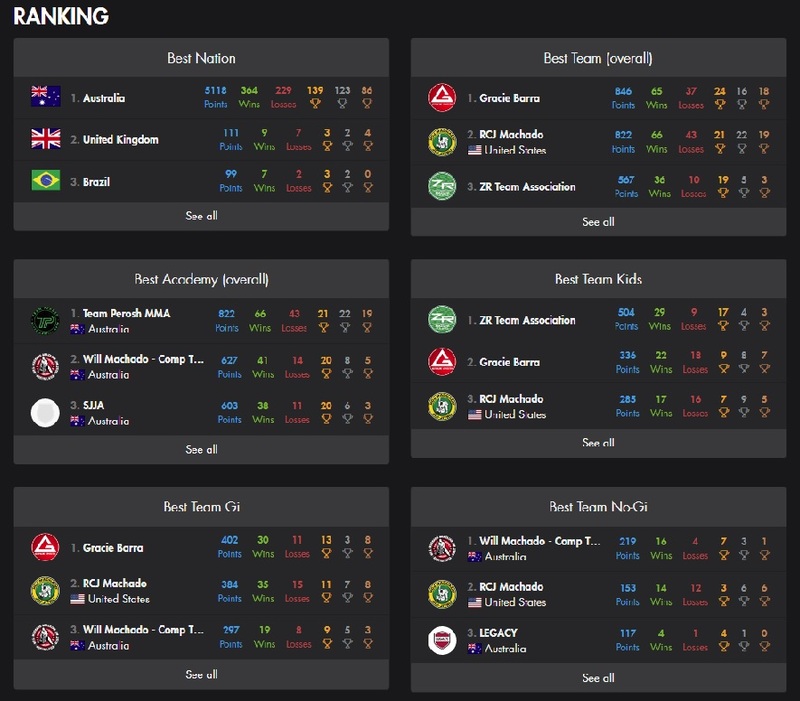 They are both great students, competitors and coaches and have a passion for BJJ. I am proud of both of them. Congratulations to all the new coloured belts! Andrew Mills, Jeff Micallef, David Greenup and Michael DeMarco were awarded their BJJ Purple Belt. Nathan Maitre, Ante Jaksic, Joseph Frangos Young and Michael Ali were awarded their BJJ Blue Belt. Congratulations to all the other 50 students who graded for their stripes from White Belt 1st stripe to Purple Belt 2nd stripe. The grading started with new black belt promotions and ended with Black Belt degrees being presented. Dean Vella and Victor Fox were awarded their 2nd Degree BJJ Black Belt and Steve Micallef was awarded his 1st Degree BJJ Black Belt. The technique demonstrated on the night from all the students who graded was flawless (Aim for perfection!). 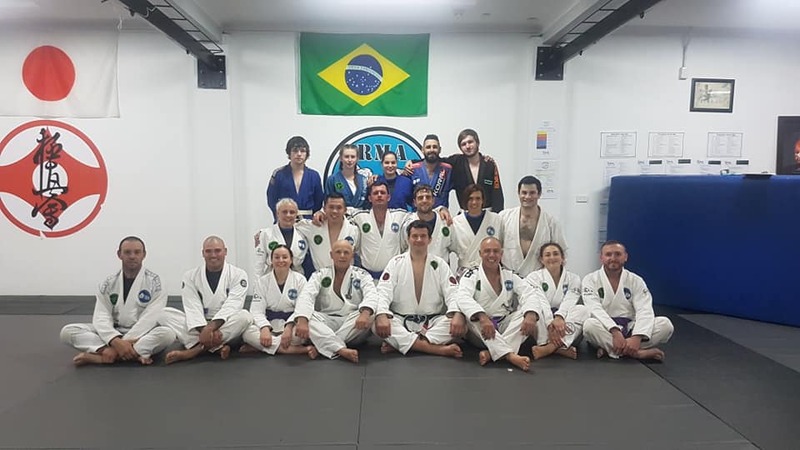 Special congrats goes to Adam Assuncao who demonstrated 50 Blue Belt techniques, 60 Purple Belt techniques, 50 Brown Belt techniques and 40 Black Belt techniques (200 in total) on the night to be awarded his stripe on his Brown Belt. And he did it flawlessly and by memory! We had 10 black belts in attendance and 42 students who were Blue Belt and above turn up to grade and support. And let’s not forget the 50 white belts in attendance. It was a great attendance for our end of year grading. A very big thank you goes to my great staff and great coaches Sari Redzeposki, Adam Assuncao, Philip Kim and Nobby Kuandyk. They are passionate about teaching like I am and want everyone to do their best. Thank you to everyone who attended to make the night extra special. See you on the mat (but I will see you first at our Christmas party!). Tyson Pedro wins in his MMA debut! 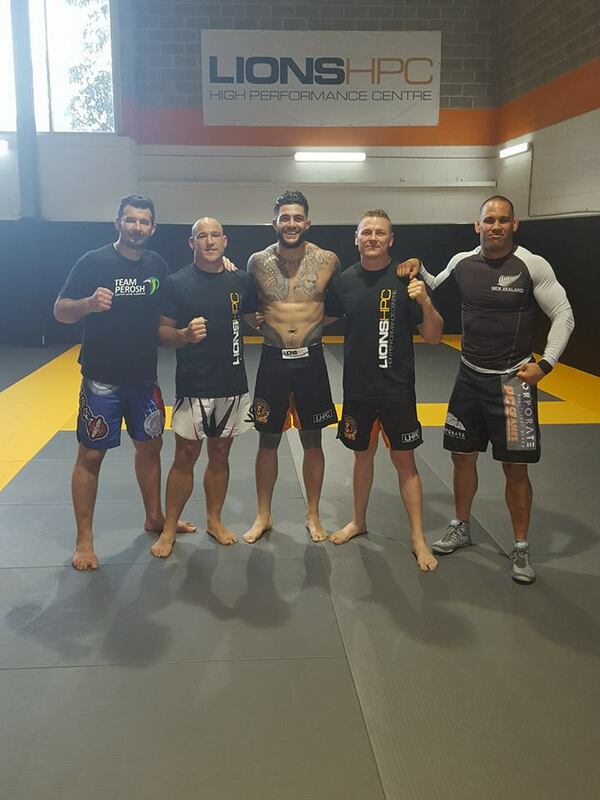 Well done to Tyson Pedro on his win in his UFC debut in Melbourne! 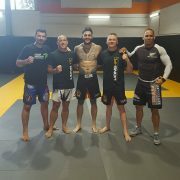 I got to train a session with him before his fight. 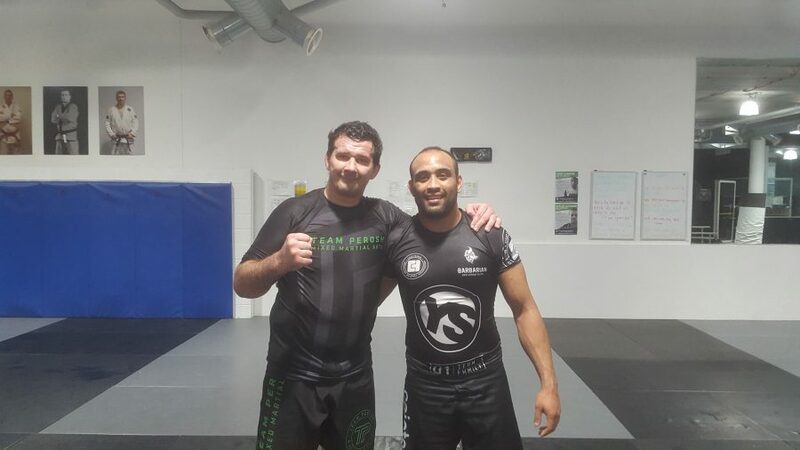 Got to train with fellow UFC veteran James Te Huna too. Thanks to Shaun Sullivan from Lions High Performance Centre for inviting me to do some BJJ wirh him. https://teamperoshmma.com.au/wp-content/uploads/2016/12/UFC_Fight_Night_Tyson_Pedro_Anthony_Perosh_November_2016.jpg 960 720 Anthony https://teamperoshmma.com.au/wp-content/uploads/2017/07/logo.jpg Anthony2016-12-06 12:58:122016-12-06 12:58:12Tyson Pedro wins in his MMA debut!